Video of the incident, recorded at Comox Marina, shows the boat being pulled at speed by the lone whale, identified as a 27-year-old male. At one point, the boat is dragged into a collision course with another. 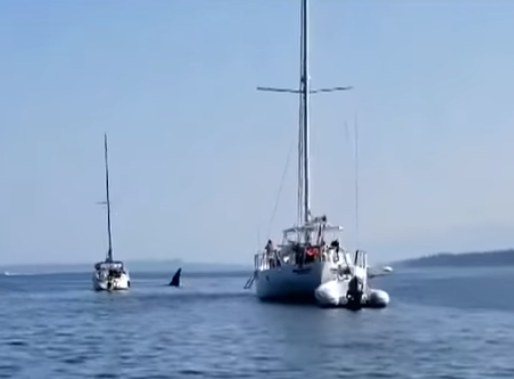 Fisheries and Oceans experts say the 27-year-old orca was showing off some playful behavior when it took hold of a sailboat’s anchor line and led the boat on a collision course. Dan Campbell, owner of the sailboat, named “R-Therapy,” said there was minor damage to both boats from the crash. As the most widely geographically distributed cetacean, the killer whale’s range is not limited by water temperature or depth. … Despite its fierce reputation, the killer whale is highly playful, often breaching and slapping the water. Orcas, also known as killer whales, are known to prey on other marine mammals, including dolphins and seals. … “They play with [whales] like cats play with their prey. They are very playful and social.” Their intelligence are shown through their playful nature, including how they play with humans in the wild. A perfect example is how they understand that a line in the water is attached to a vessel and by pulling the line it realizes that it will be “tugging” the boat through the water! Sailors all over the world should understand who or what they are sharing the worlds oceans with.